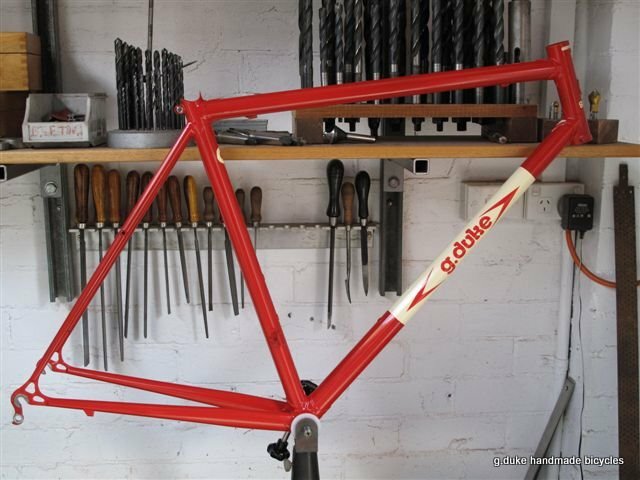 This frame was built with weight and stiffness in mind. A mixture of Columbus Genius http://www.columbustubi.com/eng/1.htm and Dedacciai tubing. The downtube flares from 32mm at the headtube to 35mm at the bottom bracket. 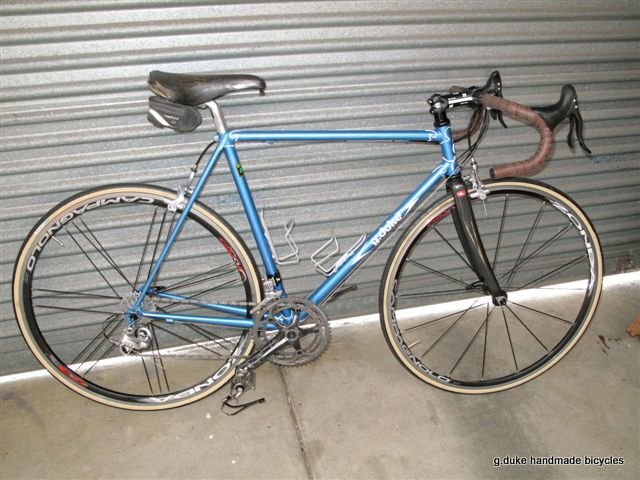 It has modified Llewelyn OS compact lugs and GP Wilson dropouts from Vincent Dominguez http://www.dominguezcycles.com/. This frame was built with tradition in mind. 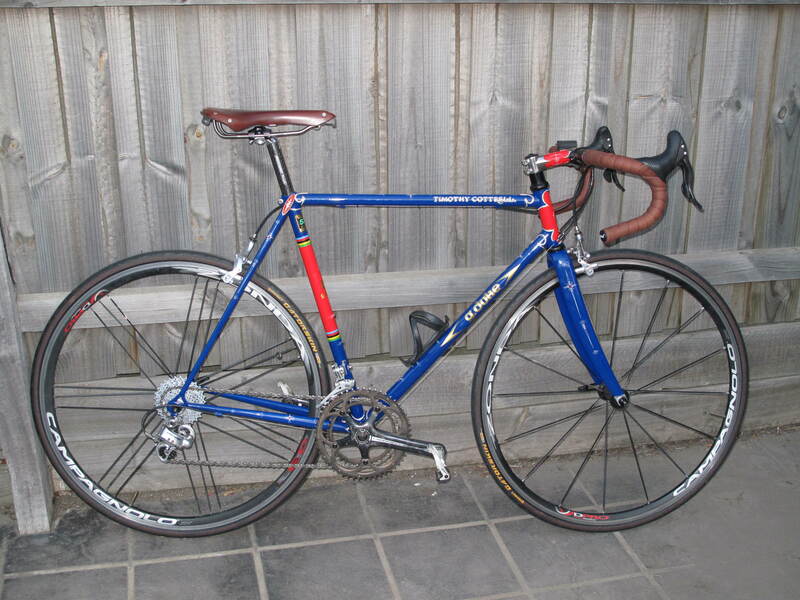 Built from Reynolds 531 tubing http://reynoldstechnology.biz/our_materials_531.php and with vintage lugs saved from the long since closed Bates Cycles shop in Coburg, Melbourne. 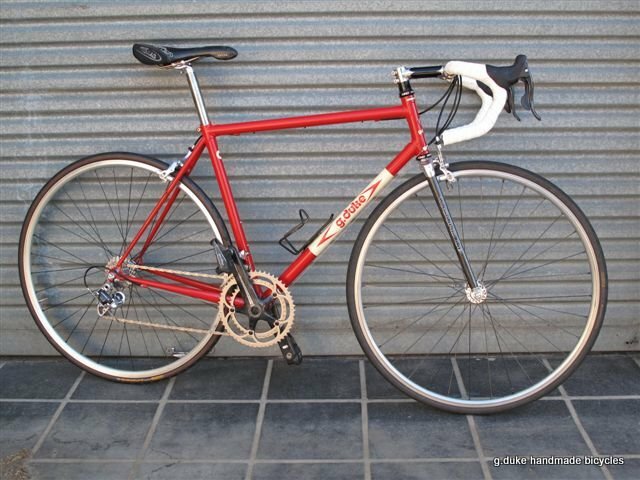 Tim wanted a bike that looked traditional but stopped and changed gears like a modern bike. 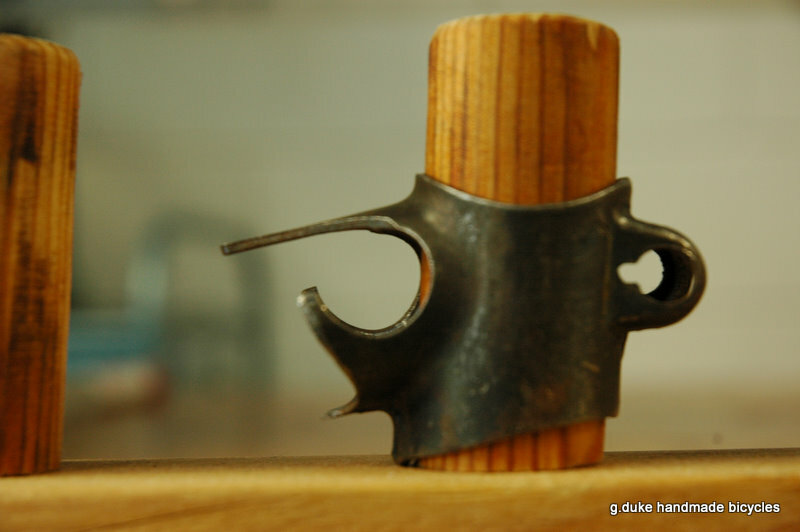 It takes a lot of preparation work to turn these vintage lugs into usable items but the end result is worth it. 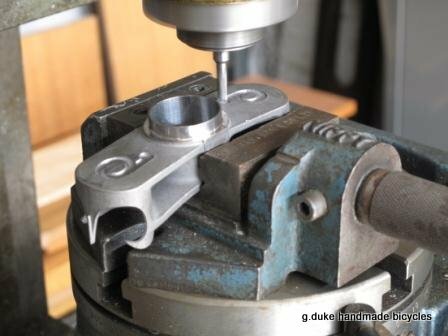 Checking the alignment of the frame is a constant task as the frame progresses. This is just one of many checks that take place on an alignment table using a height gauge. 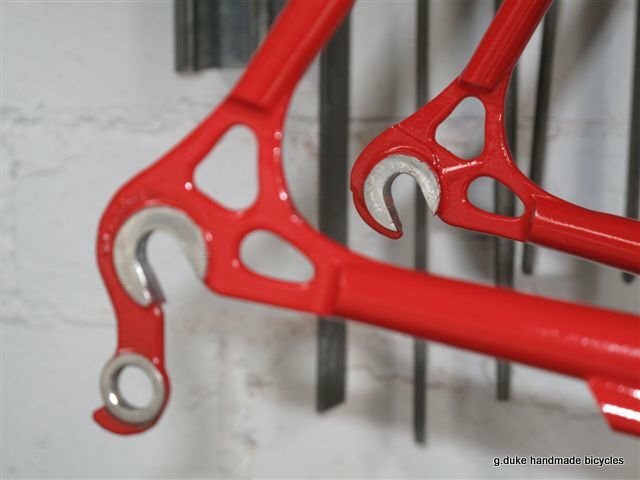 These dropouts were hand made from 316 stainless plate for a specific frame but the joining process is the same for every frame. 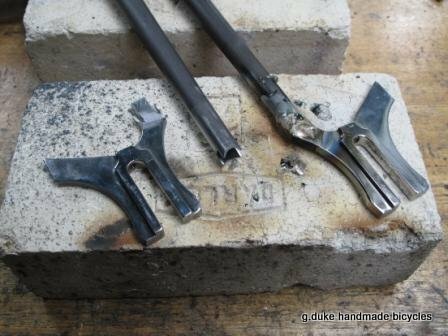 I braze the dropouts into the chainstays before assembling these into the front triangle. This same frame has a Pacenti twin plate fork crown and I decided to mill the d from my logo into it. Not all fork crowns have this touch but if you like this look an appropriate crown can be chosen. 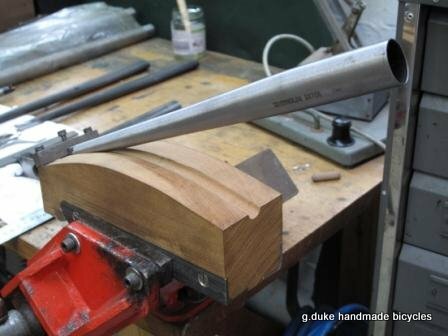 Fork bending takes place in this hardwood mandrel. 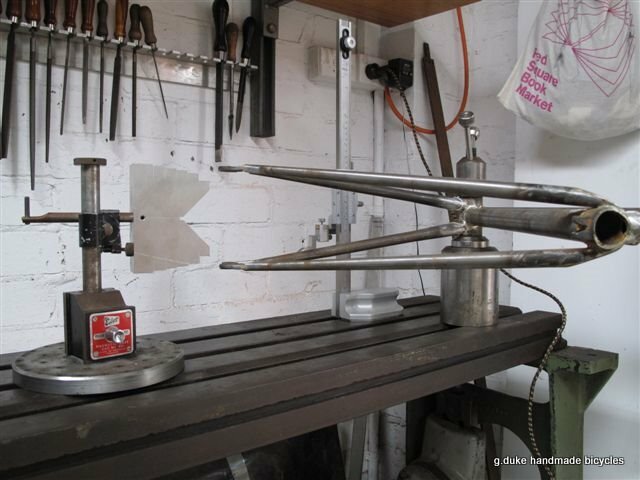 In most cases the blades come straight and if the frame has curved forks they are bent to the required amount of rake.